(by Josh Siegel, The Daily Signal) – …Wednesday (Nov. 30) was the 113th day of protests over the Dakota Access pipeline, which has become a complex battle—sometimes involving violent clashes between police and demonstrators—over tribal rights, energy development, and the environment. Last week, state and local officials applied pressure to end the standoff. Last Monday [Nov. 28], North Dakota Gov. 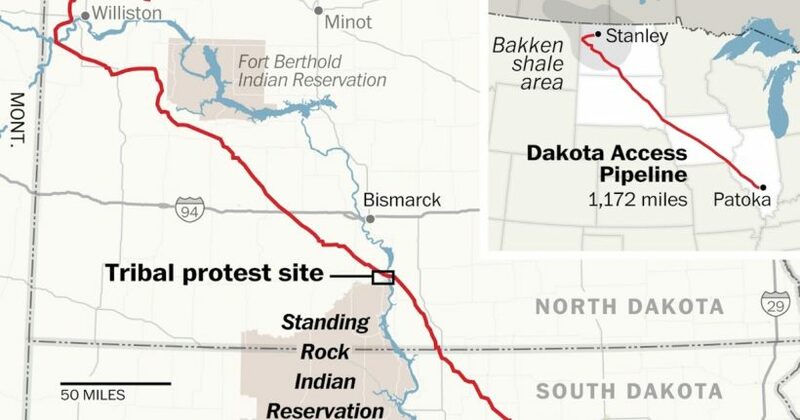 Jack Dalrymple, a Republican, ordered a mandatory evacuation of protesters seeking to block construction of the Dakota Access pipeline, a 1,170-mile transport vessel that would carry as much as 500,000 barrels of crude oil daily from the Bakken production region of North Dakota to an existing pipeline in Patoka, Illinois. …Morton County, just above the southern border of North Dakota, has a population slightly under 29,000, making it one of the state’s most populous counties. Thousands are protesting at camps located on U.S. Army Corps of Engineers land [federal government land], north of the Cannonball River in Cannon Ball, North Dakota. As the controversy rages on, The Daily Signal examines key factors contributing to division over the pipeline, and how the various parties may move forward. The Standing Rock Sioux, a tribe of about 10,000 leading the protests, fear the Dakota Access pipeline could pollute the Missouri River, the tribe’s main source of drinking water, and harm sacred cultural lands and tribal burial grounds. Standing Rock is contesting a segment of the pipeline planned to run under Lake Oahe, a reservoir formed by a dam on the Missouri River. The tribe, working with the environmental group Earthjustice, filed suit July 27 against the Army Corps of Engineers, arguing the government did not properly consult them before approving the section of pipeline near the Standing Rock Indian Reservation. This litigation is ongoing, although the U.S. District Court in Washington, D.C., refused to halt construction of the pipeline while the case winds through the legal system. Energy Transfer Partners, the company building the pipeline, says it has followed federal and state rules, and argues that the project is a safer and cleaner way to transport crude oil from fields to refineries. It says it adequately met with Native American tribes, and proposed different variations of the pipeline’s route. The company says its pipeline does not enter the Standing Rock reservation. In November, it filed a countersuit in the same federal court asking to proceed with the $3.7 billion project. The pipeline is 92 percent complete, and just a small portion of it nearest to the Standing Rock reservation remains in limbo, as the Army Corps of Engineers decides whether to grant a final permit for Energy Transfer Partners to finish it. “We’re going to let it play out for several more weeks and determine whether or not this can be resolved in a way that I think is properly attentive to the traditions of the first Americans,” Obama said. 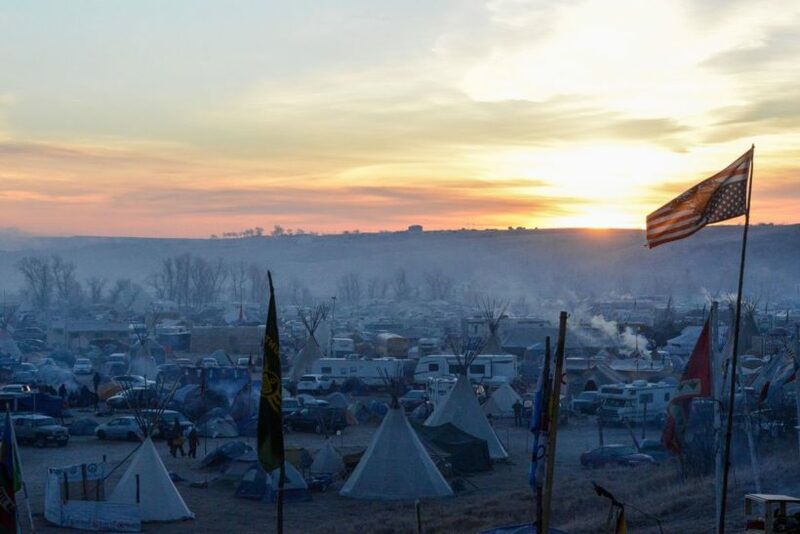 Aseem Prakash, director of the Center for Environmental Politics at the University of Washington, contends that the Standing Rock tribe’s stake in the conflict reflects deeper-seated grievances of Native Americans. Though the pipeline goes through private land and not Native American property, the tribe contends this land was acquired improperly and actually belongs to them by the terms of an 1851 treaty with the U.S. government. North Dakota’s at-large member of the House of Representatives, Republican Kevin Cramer, acknowledges the tribe’s grievances and says they are exasperated by high rates of poverty in the Native American community. The biggest losers in their issues being heard are the tribes. The concern of the environmentalists are not based on intellect or knowledge or reality, and I think all of that dilutes legitimate concerns of the tribes that call out for broader discussion. Indeed, after successfully influencing the Obama administration to reject the Keystone XL oil pipeline, environmental groups latched onto the North Dakota project as the next frontier as it aims to limit fossil fuel use and delivery. This is a very good opportunity for them because the best way to bankrupt fossil fuel companies is to target the supply chain—the modes of transportation. Some tribe members think their issues are being hijacked. For them, this is not a war on fossil fuel. It’s a specific argument about not honoring the historical practices of Native Americans and about rerouting this particular pipeline. … Even after the pipeline’s future is resolved, local officials say, they recognize the underlying feelings that drove the protests won’t be healed quickly. Josh Siegel is the news editor for The Daily Signal. Reprinted here for educational purposes only. May not be reproduced on other websites without permission from The Daily Signal. Visit the website at dailysignal .com. 1. For how many days have protests taken place over the Dakota Access Pipeline? 2. List the issues protesters are concerned about in general. 3. a) How long is the pipeline? b) How much oil per day will be transported through the pipeline? c) What are the starting and ending locations of the pipeline? d) How much of the pipeline is complete? What portion is being protested? 4. What groups are part of the protests? 5. a) For what reasons is the Standing Rock Sioux tribe protesting the pipeline? b) How does University of Washington’s Aseem Prakash explain the Standing Rock tribe’s opposition to the pipeline? 6. How has the company building the pipeline, Energy Transfer Partners, defended its construction? 7. The area of the pipeline that is the center of the controversy must be granted permits from the federal government. How has President Obama addressed the continuing protests and controversy? Media reports have documented violent clashes between police and protesters. Authorities have used rubber bullets, pepper spray, and water cannons against demonstrators, according to the tribe, and hundreds have been injured. Many public officials, including Congressman Cramer and Cody Schulz, the Morton County Commission chairman, defend the force used by police, however. They say that some out-of-state protesters have instigated the violence, and they view the protest as an illegal occupation of federal land. What do you think of the assertions made by the protesters and these local officials? With whom do you agree? Explain your answers. All parties agree that the Obama administration is running out of time to see through the end of the conflict. Yet local officials are waiting for help. Morton County Commission chairman Cody Schultz says he is frustrated with Washington because the federal government’s indecision has prolonged the demonstrations and drained local law enforcement money. Considering this, do you think President Obama should have made a decision on the pipeline? Explain your answer. 10. What did Morton County’s Cody Schulz say that leads you to believe officials want to maintain a good relationship with the Standing Rock Sioux?